Are you mystified by multiplication? Flustered by fractions? Dazed by division? One of the most common frustrations you’re likely to face as a parent is an occasional inability to help your child with their homework. This can easily be avoided though, as there are plenty of resources out there with maths tips for parents who want to help their children with homework. Keen to learn more? Let’s jump in! Ah, the internet, is there anything it can’t do? A simple Google search reveals that there is a myriad of useful sites out there that can provide maths tips for parents who wish to improve their skills. Our two personal favourites are the National Numeracy and BBC Skillswise pages. Much like Maths-Whizz, the National Numeracy website allows adults to undergo an assessment which pinpoints gaps in their core maths knowledge before recommending online resources they can use to close these gaps. Incidentally, one of these recommended resources is Skillswise, a website which covers every common sense maths topic from number lines to averages. Each topic covered on Skillswise includes a video which explains the practical reasons why the subject should be mastered as well as games and quizzes to test learners’ proficiency. Hey, just because you’re an adult, it doesn’t mean you’re above going back to school! If learning online is not for you, there are plenty of in-person adult education courses out there that provide maths tips for parents. Some of the benefits of in-person courses include the opportunity to mingle with other people, the opportunity to ask your instructor more precise questions and the opportunity to learn from your peers. Maths lessons that you can take anywhere with you? That sounds good to us! Maths apps are ideal for time-poor parents as they can be easily integrated into even the most hectic of schedules with minimum interruption. One free app that has been making quite a splash is the Maths Everywhere app by Modern English. If you’re time poor and don’t think you can commit to a course that teaches parents how they can help with maths, downloading a maths app could be an ideal solution. i) When multiplying a number by 10, all you need to do is stick a zero at the end of it or push the decimal point one place to the right. ii) Similarly, when dividing by 10 all you need to do is pull the decimal point one place to the left. iii) Additionally, you should always remember that one percent of a numeral is simply that number divided by 100, which can easily be found by shifting the decimal point two places to the left. What’s that old saying about practice making perfect? If you really want to sharpen your maths skills the best thing is to use it in the real world. Not only will you benefit from this but you’ll also set your child an excellent example by showing them how valuable it is to master basic maths. For an extra challenge, try to ditch the calculator in favour of a pen and paper. If you do this regularly, you’ll eventually get to the stage where you don’t need to write things down and can just rely on mental maths. According to a recent survey conducted by the Institution of Engineering and Technology, more than a quarter of parents of school-age children (26%) believe that their lack of confidence in science, technology, engineering and maths had affected their children’s performance in those subjects. This is an alarming statistic, but we believe it can be overcome by embracing growth mindset. Growth mindset is an educational theory that states if a person believes that their abilities are not fixed, they should be able to improve performance in areas that they initially struggled with by making a conscious effort to improve. We think that if parents embrace growth mindset by believing they can improve their maths skills, they can go a long way in helping their children succeed in maths too. Does your child need a little extra help? Helping your child with their learning can often be one of the great joys of parenthood. We hope these six maths tips for parents will go a long way in helping both you and your child improve in maths and realise this joy. 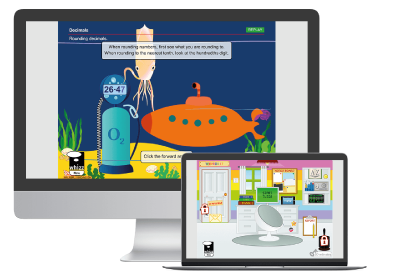 Additionally, if you’re looking for a tool to help boost your child’s maths attainment, you should check out Maths-Whizz, the multi-award-winning online maths tutor from Whizz Education. Thanks to its educational maths games, children who use Maths-Whizz experience 18 months growth in maths ability in their first 12 months of use. * To find out more, try out our free trial today!